Potash production is on the rise, with potash companies on pace to produce 61 million MT by 2019. Canada leads the top potash-producing countries. Despite oversupply concerns, potash prices have risen in 2018 due to greater demand. According to the US Geological Survey, other potash operations set to come online between 2018 and 2021 include new mines in Belarus, China, Russia and Spain. These new projects could add an additional 15 million MT of output by 2021. The organization estimates that consumption will increase to 45.6 million MT by 2021, and suggests that Asia and South America will be the largest potash consumers. With that in mind, it’s worth looking at the top countries for potash production in 2017. Here’s an overview of the 10 countries that produced the most of the fertilizer, as per US Geological Survey data. First on the list for top potash production is Canada. The country’s potash production jumped from 10 million MT in 2016 to 12 million MT in 2017. Canada is home to Nutrien (TSX:NTR,NYSE:NTR), the largest potash company by capacity. The company is newly formed, having been created via the merger of Potash Corporation of Saskatchewan and Agrium. The two came together in early 2018 to “create a global agricultural giant” valued at $36 billion. Potash production in Russia also hopped up in 2017. It put out 7.2 million MT of potash compared to 6.48 million MT in 2016. Uralkali (MCX:URKA) is a major potash producer in Russia. The company has five mines and seven ore treatment mills. It exported 10.9 million tonnes of potash in 2017, a figure that represents growth of 16 percent year-over-year. In Belarus, 2017 potash production was slightly below the amount put out in 2016. Potash production came in at 6.4 million MT last year compared to 6.18 million MT the year prior. Belarusian Potash Company was once the most powerful potash firm in the industry, with some calling it a cartel. Since Uralkali pulled out of Belarusian in 2013, its former partner, state-owned Belaruskali, has had a rocky road to recovery. Belaruskali has six mines and four processing factories. Its reserves are estimated to be 247.5 million tons. Despite an accident this year at one of its mines involving a rock slide and two missing workers, Belaruskali’s production has not been affected. Looking over to China, potash production remained the same from 2016 to 2017, at 6.2 million MT. Potash is extremely vital in China — the country is the largest consumer of the fertilizer, accounting for approximately 20 percent of world consumption. Chinese demand bounced up in 2017, and the country’s agreement with potash giant Uralkali established a much higher benchmark price for the year. In Germany, potash production stayed nearly the same from 2016 to 2017, going from 2.8 million MT to 2.9 million MT. K+S (ETR:SDF) has a number of projects, operating six mines in three districts of Germany. The company began production at its new Bethune mine in Saskatchewan in 2017. K+S states that it is ramping up to have an annual capacity of 2.86 million tonnes of potash from the Bethune facility alone. Potash production in Israel ramped up a bit in 2017. The country produced 2.2 million MT compared to 2.05 million MT the year before. The country is sixth in terms of potash production, and it also hosts the world’s sixth-largest potash-producing company: Israel Chemicals (TLV:ICL). The company has about 6 million MT of annual capacity, and produces roughly a third of the world’s bromine. While potash production in Jordan increased marginally from 2016 to 2017, the country fell short of Israel and got bumped down to seventh place. Arab Potash Company, located in Jordan, is the eighth-largest producer of potash by volume, and is the sole producer of potash in the Arab region. It has helped make Jordan a key potash supplier for India and Asia. Chile recorded production of 1.2 million MT of potash in 2017, the same as the year before. One of the largest producers of potash in the country is Sociedad Quimica y Minera (NYSE:SQM), which is also a leading producer of lithium. South America in general is a large consumer of potash. Spain remained in ninth place for potash production in 2017. Last year, the country produced 680,000 MT of potash, up from 670,000 MT the year prior. Spain has reserves of 44 million MT of potash. Geoalcali has a few potash projects in Spain, including: Izaga, Muga and Sierra Del Perdon. The US bumped the UK from the 10th spot on the list in 2017. According to the US Geological Survey, total potash production for the US was worth $400 million in 2017, which represents a 25-percent decrease from the previous year. Production came mostly from Southeastern New Mexico and Utah. The country put out 480,000 MT of potash for the year, a relatively steep drop from 2014, when it put out 850,000 MT of the mineral. The center of US potash production is New Mexico, where four mines are operated by two companies; Utah also has three potash operations. US potash goes largely to the fertilizer industry, with leftover output finding its way to the chemical and industrial sectors. 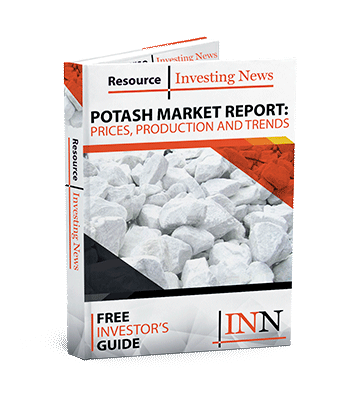 Now that you know more about potash production, click here for more articles on this space. I am an employee of ICL company in Ethiopia Danakil depression. we are striving to be a solution for potash demand in the world. your web site plays a great to know more about potash type and production strategies as well. keep it Up!! Could these two consumption numbers be mixed up? – In terms of consumption, according to the US Geological Survey (USGS) estimates that it is expected to increase from 49 million tons in 2016 to 43 million tons in 2019. Hi Murray, thanks for the comment! That was a typo — the US Geological Survey estimates that consumption will rise from 39 million MT in 2016 to 43 million MT in 2019. We have updated the article with the correct information. Where in the greater scheme of things does that leave Karnalyte (Sasktchewan) ?